Power Swabs Reviews - Is It a Scam or Legit? 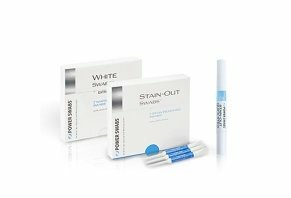 For those who want a teeth whitening system that provides stain removal and whitening, Power Swabs gives you a swab-based system that uses an ingredient proven to whiten teeth. Power Swabs is a teeth-whitening regimen through which you use a set of swabs to apply peroxide gel and whiten your teeth over time. What makes this product unique is that multiple celebrities have endorsed it on Twitter: actress Haylie Duff, model Cynthia Bailey, and media personality Joy Bauer. The product is the brainchild of Dr. Martin Giniger, whose career is pretty colorful. According to his website, Giniger graduated from Farleigh Dickinson University’s School of Dentistry and got a Ph.D. in chemistry from the University of Connecticut School of Dental Medicine. In addition to being a consultant and expert witness in dental lawsuits, Giniger’s enterprise performs research about and development of various “oral care products,” of which Power Swabs is one. In this review, we’ll talk about how Power Swabs work, how much they cost and how they compare, price-wise, with other teeth-whitening products. Along the way, we’ll provide some quotes from experts about teeth whitening. The goal of the Power Swabs kit is to get yellow stains off your teeth and then whiten them. It’s a two-step process and, as such, comes with two separate mini-kits: Stain-out swabs and white swabs. Your Stain-out swabs are designed to remove stains from the teeth. Most often, those stains manifest themselves in the form of a yellow coating that results from things like smoking, coffee, tea and all the other things we eat, drink and smoke. According to the directions, you’ll use the swabs to apply the gel that comes with your Stain-out kit for a total of two minutes. A couple of important things to know are how long the whitening lasts and what the possible side effects are. As for side effects, one of the main concerns related to teeth whitening – strips, toothpaste, and gels – is irritated gums. This is the first thing that Seattle-area dentist Dr. Libbi Finnessy pointed out to us. “White strips and whitening toothpaste are my pet peeves -- people waste money on products with the lowest concentration that remove surface stains and irritate and even burn their gum tissues as the strips are not made to fit your mouth because they're a universal size,” Finnessy said. As for which whitening products work best, Dr. Ron Baise, founder of London-based 92 Dental, told us that there two ingredients that actually work. “The only tooth whitening products with solid clinical evidence of effectiveness are ones which contain the active ingredient of hydrogen peroxide or carbamide peroxide,” Baise said. He went on to tell us that most over-the-counter teeth whiteners produce results not because of the ingredients they contain, but for an entirely different reason. Based on the information we gathered from these experts, we believe there is some fact-based evidence that Power Swabs will, in fact, whiten your teeth because it contains carbamide peroxide. According to doctor Baise, this is one of two ingredients whose whitening power research can back up. Just keep in mind that these ingredients can be harsh, Finnessy noted, so make sure you keep Power Swab away from your gums. If you’re concerned about hurting your gums, she said that dentists use special techniques to “block out your gum tissues” to ensure the whitening agent doesn’t touch them. At the time of publishing, the Power Swabs website was selling a seven-day supply for $59.90. There was one other offer, too: $119.80 for a three-week supply as well as three Stain-out quick sticks. These sticks are quicker versions of the Stain-out swab packs. If you aren’t happy with Power Swabs, the company offers a 30-day money-back guarantee (less shipping) that covers the first 30 days after your order in order to meet that deadline, you’ll need to call 800-535-4693 to start the return. You can also contact the company at customercare@powerswabs.com. To give you an idea of what similar products are charging for teeth whiting, we wanted to give you a quick overview of how three other products we’ve reviewed: Spark Whitening and Whitening Coach. A 30-day supply of these products costs $129.99, which is cheaper than what you’d pay for a one-week and three-week supply of Power Swabs, which would be around $180. Both products contain carbamide peroxide, the ingredient we mentioned earlier that’s been proven to provide white teeth. Based on these comparisons, we believe there are other products we’ve reviewed that provide a better value. Now, when it comes to whiteners that you can buy over-the-counter at places like Target and Walmart, the online-based products we’ve reviewed are considerably more expensive. For example, Crest’s Noticeably White Whitestrips are available at Target for $18.99. A month’s supply requires three boxes, which puts the price of the treatment at $56.97. We live in a great time for using at-home teeth whitening – there are dozens of options to make your teeth whiter. As we point out in our guide to at-home whitening kits, some work better than others. Gels like Power Swabs and whitening strips tend to make your teeth 1-2 shades lighter but don’t work quite as good as whitening trays. Based on our research of Power Swabs, we believe that its claims to whiten your teeth are true based on the ingredients. However, we’d be hard pressed to recommend the product over something like Crest Whitestrips. But this conclusion comes with a caveat. The Power Swabs system provides you with more control over protecting your gums from the cleaning and whitening compounds. If you worry that whitening strips or trays don’t provide the precision you’d like, Power Swabs could be the solution. Write a Review for Power Swabs!